The quota system in India has taken an ugly turn is last few years. From Jats to Gurjjars to Patidars every community have been asking their share of pie in the quota system. Now, Kapus in Andhra Pradesh are demanding to be included in the backward class list. 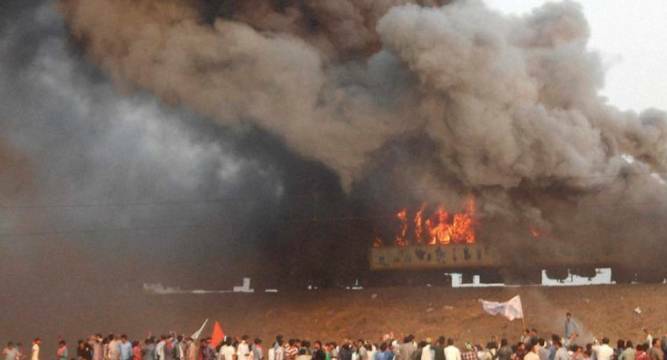 Yesterday, the violence in the East Godavari district by Kapus is a tragic farce that is unfortunately played by Indian politicians. Kapus ablaze eight bogies of Ratnachal Express in Tuni railways station. The protestors pelted stones at the train and attacked police officials when they tried to stop them from ransacking the train. Over the years, with help from opportunistic politicians, the drama quota drama has been played twice in Rajasthan, once in Gujarat and is now in Andhra Pradesh. The agitation by the Kapus too borrows heavily from the agitation by Jats, who were given OBC status by the Atal Bihari Vajpayee government. Kapus leader and former minister Mudragada Padmanabh, like Patidar leader Hardik Patel who advocated violence in support of their demand, said the Chief Minister should realise the urgency of the situation. Like the Jats and Patidars, the Kapus are a powerful political entity and with 16 pc of the total population in Andhra they can turn tables. Like Patidars (Patels) of Gujarat, Kapus also dominated the state. They entered into the cinema industry and dominated its production, distribution and even exhibition. They even have dictate terms in both print and electronic media. Film stars like Chiranjeevi and Vijay Kanth are from the Kapu community. Like Patels, the Kapus are also influential, affluent, politically empowered and now wants to be called backward class. Their stir is in initial stage and the Chandrababu Naidu government cannot ignore them also. The state govt can’t give them the benefits as it has crossed its 50 pc limit imposed by the Supreme Court. If the state govt will tinker the existing quota then it can create problems for other class. As long as our law makers continue to use quota to divide the society and not find out any way to solve these issues, India will continue to burn.